Knitting is good for the sole, so cast on and don't drag your heels! 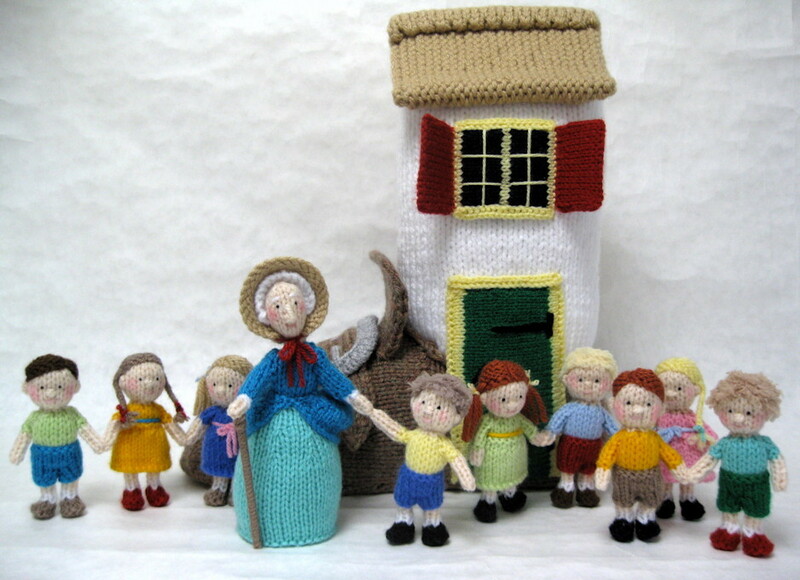 Measurements: Shoe House: 12½in (32cm) tall and 11in (28cm) long; Old Woman: 6in (15cm) tall; Children: 3¾in (9.5cm) tall. You will need: Of Hayfield Bonus Chunky 100g balls: 80g Grouse 815, 60g White 961, and 40g Wheat 816; of Hayfield Bonus DK 100g balls: 30g Flesh Tone 963, 12g each Primrose 957 and White 961, 10g Classic Red 833, 5g each Azure 824, Vivid Turquoise 818, Wheat 816, Emerald 916, Silver Grey 838 and Navy 971, 2g each Walnut 927 and Black 965; approx. 2g oddments of DK yarn in chosen colours for children’s clothes and hair; approx. 1g oddments of Sirdar Snuggly Snowflake DK in boy’s hair shades; oddment of dusky pink DK yarn; pair each of 4mm (no.8) and 3mm (no.11) knitting needles; stitch holder; 175g of washable toy stuffing; stiff cardboard; thin card; a cotton bud; pink pencil; double-sided sticky tape; clear adhesive; pair of compasses; ruler; craft knife; long tweezers; hair spray.